Ami Shunechi Sedin Tumi Song is Sung by Mousumi Bhowmik from Amaar Kichhu Kotha Chhilo Bengali Album. Shopno Dekhbo Bole Bengali Song lyrics Cover version Song is Sung by Iman Chakraborty, Paromieta Majumder And Many Various Artists. Music Recreated by Arun Dasgupta. Swapno Dekhbo Bole Song Recording, Mixing & Mastering by NoiseZone. 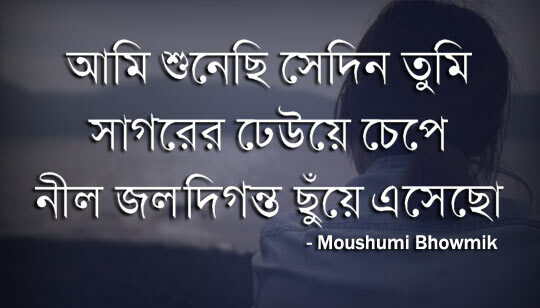 নেবে তো আমায় বল নেবে তো আমায়? কোথায় শান্তি পাব কোথায় গিয়ে?